Chock full of humor and enchanting illustrations, this captivating picture book is sure to entertain and inspire. 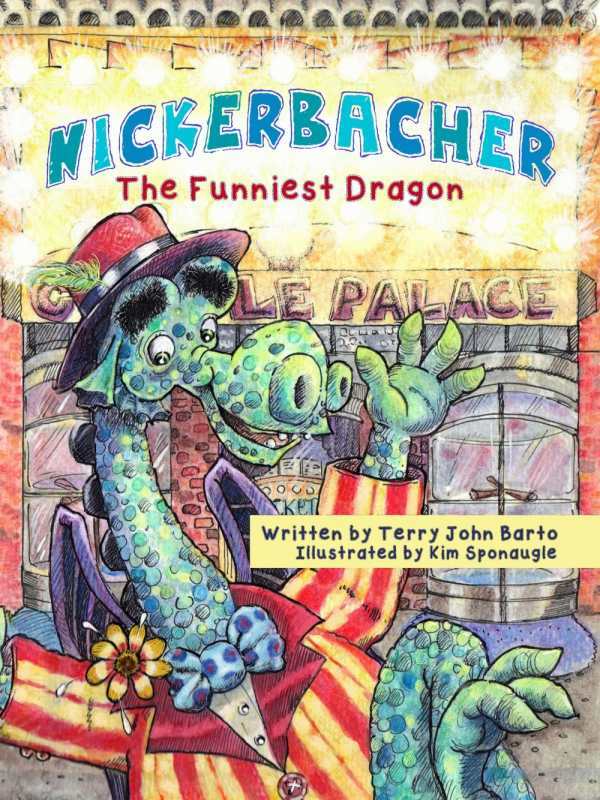 A fairy tale for independent dreamers, Nickerbacher, The Funniest Dragon, by Terry John Barto, is a lighthearted mix of bravery, kindness, and family, bringing together a knight, a princess, and a modern-minded dragon with aspirations for success in the big city. The award-winning Nickerbacher, colorfully illustrated by Kim Sponaugle, is sure to entertain and inspire. Nickerbacher stands watch over Princess Gwendolyn in her castle; as everyone knows, “every dragon has a duty to guard princesses.” He secretly longs to escape to the stage and pursue a career as a stand-up comedian, but fears the disapproval of his father. When Prince Happenstance, who has a secret wish of his own, attempts to battle Nickerbacher, the outcome is heartwarming and hilarious, resulting in Nickerbacher’s much-anticipated comedic debut. With his Groucho Marx eyebrows and soulful expressions, Nickerbacher’s playfulness and earnestness are expertly captured by the illustrator. Using a combination of her trademark watercolor, pastels, and pen and ink, Sponaugle’s illustrations shine, tying together modern city scenes with a dreamy renaissance castle and earning Nickerbacher a 2015 Purple Dragonfly Book Award for best illustrations. The jump from royal rural to urban contemporary is swift but smooth, and Nickerbacher seems at home both in front of the castle and in front of a microphone. The story progresses quickly, adding to the light feel despite the themes of family approval, fear of rejection, and the courage required to seek out your own brand of happiness. This adds up to make Nickerbacher, The Funniest Dragon perfect for elementary-school-aged children, but with enough humor and enchanting pictures to captivate older audiences as well.